Will I be able to find a cosmetic dentist to reverse my gap closure? It is likely that the dental crowns you received from the cosmetic dentist are the cause of your speech problems and your neck and jaw pain. True cosmetic dentists close gaps with dental crowns and their patients have no speech issues or neck and jaw pain. What Is True Cosmetic Dentistry? Although Dr. Szarek would need to examine your teeth, crowns, and bite, it seems that your cosmetic dentist opened your bite too far. Crowns that are too thick or too long can prevent your lips from closing together naturally. If your crowns are too thick, your bite—or the way your teeth fit together—could be misaligned and jaw and neck pain can result. Can Your Gap Closure Be Reversed? We realize that you’re disappointed and frustrated. When a patient receives dental crowns, his or her natural teeth are prepared—significantly shaved down—to ensure the dental crowns fit over the teeth. The tooth reduction cannot be reversed. Unfortunately, you won’t be able to have your natural teeth as they were before. If the issue cannot be corrected with your existing crowns, you will need new crowns. You’ll need a consultation and a second opinion. Before you schedule a consultation, try to find an accredited cosmetic dentist. If you can’t find an accredited dentist, select a cosmetic dentist who has extensive training, beyond dental school, in occlusion/bite and cosmetic dentistry. Look on the dentist’s website for information on his or her education, training, and credentials. Schedule a consultation; it will likely last 10-15 minutes. Some patients decide to schedule consultations with two different cosmetic dentists so they can compare options, costs, office environments, the dentist’s interaction with them, and whatever is important to the patient to have a positive experience. During the consultation, ask to see before-and-after photos of the work the dentist has completed on multiple patients whose gaps were closed with dental crowns. If you’re pleased with your interaction with the dentist, you can schedule an appointment for an examination to determine the cause of the issues you’re experiencing. After an examination, and possibly digital x-rays, the dentist will explain the source of the problem, as well as your treatment options. The before-and-after photos below show how cosmetic dentistry with dental crowns can beautiful close gaps between teeth. This post is sponsored by Dr. Michael Szarek. Dr. Szarek is located in Lowell, MA and is accredited by the American Academy of Cosmetic Dentistry. Ariana Grande is one of the most followed celebrities on social media. And millions of girls say they love Ariana Grande’s smile. 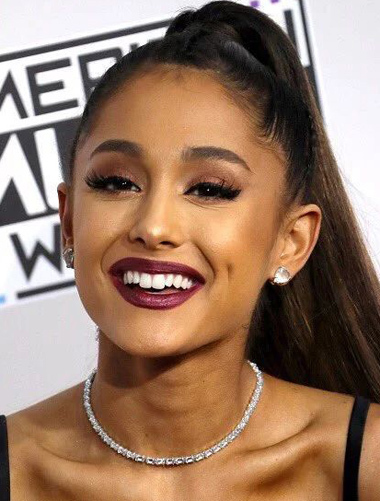 While it’s not realistic for fans to become patients of Ms. Grande’s cosmetic dentist, many of them want to know how they can get a smile like Ari’s. What’s the attraction? Many people who want a smile makeover ask their cosmetic dentist for perfectly even, perfectly symmetrical, perfectly white teeth. But that’s not what Ari’s smile is about. Her central incisors (front center teeth) are noticeably longer than her surrounding teeth. And the teeth on either side of her smile lack perfect shape. Her smile is bright, but not stark white. Youthful girls like the look of Ariana Grande’s teeth because they are different and natural looking, and fans want to copy it. But what should you know before asking your dentist for a smile makeover that will resemble that of your favorite celeb? Before applying for accreditation, a dentist has completed extensive post-graduate training in cosmetic dentistry and has years of experience in the field. Accreditation requires very high levels of clinical skill. Written and oral examinations and extensively documented patient cases are required by applicants. Highly aesthetic results are only produced by dentists who are artists and understand the tools and techniques required to achieve the results you want. Accredited cosmetic dentists are accomplished artists. 3. Which Cosmetic Dentistry Treatment Will Be Used? 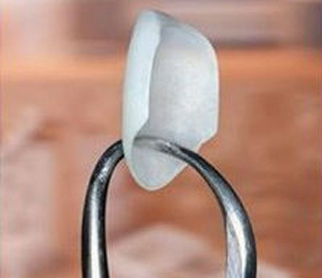 Porcelain Veneers – Customized thin wafers of porcelain are bonded to the front of your teeth. Often, your teeth must be prepared for porcelain veneers so they look natural from the gumline to the edge. Porcelain mimics natural teeth, and an accredited cosmetic dentist can produce stunning results with it. Dental Bonding – Cosmetic dental bonding is less expensive than porcelain veneers, but it doesn’t last as long. Still, a dentist who is an artist understands how to manipulate bonding so the color, shape, and gloss look natural. In time, bonding picks up stains and needs to be periodically polished by your cosmetic dentist and eventually replaced so it stays fresh and vibrant. Teeth Whitening – Teeth whitening is recommended before you receive veneers or dental bonding. The cosmetic work is then crafted to match the shade of your newly whitened teeth. Contouring – The skilled hands of an artistic, accredited cosmetic dentist can contour, or shape, your teeth into the desired look. If you want to transform your smile with cosmetic dentistry, don’t schedule an appointment with a dentist and insist on a certain look or treatment. Schedule a consultation with an accredited cosmetic dentist to discuss your goals, your options, and the results you can expect. You will get amazing results that just might give Ariana Grande’s smile a little competition. This post is sponsored by Dr. Michael Szarek, a Lowell MA dentist who is accredited by the American Academy of Cosmetic Dentistry. If you’re interested in new trends in cosmetic dentistry, read about San Diego Bioclear—a technique that improves tooth shape, spacing, and color. Porcelain veneers can provide a stunning smile makeover, but there are six things you should know about them before making the investment. Porcelain doesn’t automatically produce natural-looking results. If you want a smile makeover that looks natural, you need a dentist and ceramist who know how to manipulate porcelain so it has the color, characteristics, and translucency of natural teeth. Bonding techniques are critical to the life of your porcelain veneers. Veneers that are improperly bonded to your natural teeth can slip, loosen, or fall off. The shape and form of your veneers determine whether they complement your lips and other facial features. Only a cosmetic dentist can refine the details. Your natural teeth are prepared before you receive porcelain veneers. This involves lightly shaving them to prevent the veneers from looking bulky over your teeth. After your teeth are prepared, it isn’t possible to reverse the process. You will always need veneers or some other form of cosmetic dentistry over your teeth. Dentists become comfortable with various brands of veneers for a variety of reasons. The dentist’s skill level, the results produced, and other factors determine which brands a dentist uses. Avoid asking your dentist for a specific brand. You might choose a brand the dentist isn’t comfortable with, and if you insist on it, the results might not look good. Ask your dentist which brands he or she uses and why. The response can build your confidence in the dentist, instead of in a certain brand. If you select a cosmetic dentist, you can trust you’ll get great results. You won’t have to ask a true cosmetic dentist to let you try on a trial set of your customized veneers. It will be part of the process. But you should know that in order to really see how the finished product—your porcelain veneers—will look and feel, you have to try on temporaries. If your dentist doesn’t offer you the opportunity to try on trial veneers, beware. And be certain to try on the final product before it’s permanently bonded to your teeth. Ask your dentist what he or she does to ensure your smile makeover will be exactly what you want. Porcelain veneers are an investment. So don’t let cost alone determine which dentist you choose. A highly skilled cosmetic dentist who uses quality materials and who is picky about the results will have higher fees than other dentists. We recommend that you schedule consultations with at least two cosmetic dentists. If you can find an accredited cosmetic dentist in your area, you’ll likely get amazing results. Ask to see before-and-after photos of smile makeovers with porcelain veneers for actual patients of the dentist. You can get the celebrity smile—or the simple, but stunning smile makeover—you’ve always wanted. Do I really need porcelain veneers instead of teeth whitening? Artuela – We recommend that you schedule an appointment with an experienced cosmetic dentist. There are several reasons why you should see a cosmetic dentist before receiving teeth whitening or porcelain veneers. Why See a Cosmetic Dentist about Porcelain Veneers? He or she will examine your teeth, do diagnostic studies if necessary, and determine the cause of the stains in them. You will also find out which treatment is best to brighten your smile. Artistic cosmetic dentists have significant training and experience with whitening teeth that other dentists have had difficulty whitening. If you are a candidate for teeth whitening, a cosmetic dentist will know which form of whitening will work for your case. He or she may also be able to explain why porcelain veneers were recommended by your dentist. Without examining your teeth, we can’t speculate on the reason for that recommendation. Find a few experienced cosmetic dentists—preferably accredited cosmetic dentist—in your area, and schedule a consultation with each of them. You will be more comfortable choosing a provider for your treatment after the consultations. See our blog post on what you should know before choosing porcelain veneers.